Mike Ricker. Photo by Erick GIbson. The students at Sun & Moon Yoga in Arlington are bent at the waist, balancing on one foot—or trying to—in half-moon pose. Grateful Dead and Cowboy Junkies tunes create a mellow vibe in the dimly lit room, where the group has been sweating and contorting in flow-yoga, or vinyasa, for the last hour. 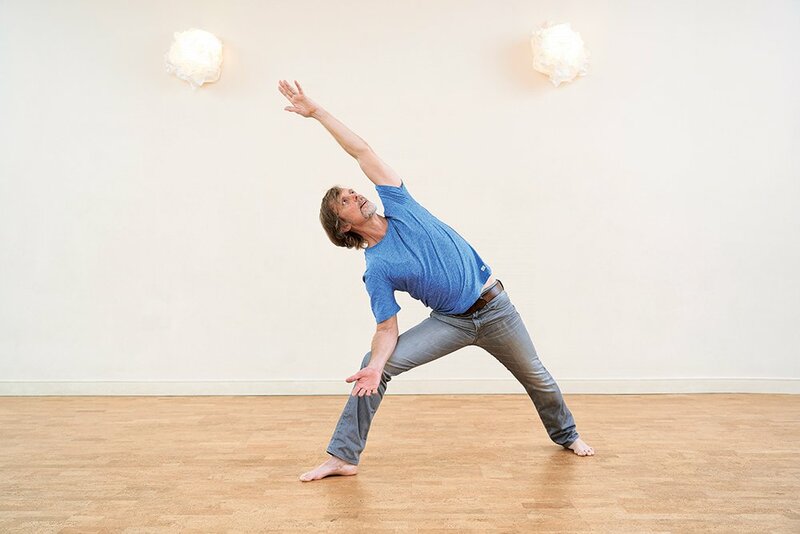 Mike Ricker is urging participants to open their hearts by extending one arm toward the ceiling while the opposite leg sticks out behind them. The soundtrack shifts to Bruce Springsteen and The Rolling Stones as the group transitions gracefully to plank, cobra and then downward dog. Not exactly something you hear every day in yoga. Neither is Ricker’s suggestion at the beginning of class to connect eye-to-eye with others sitting across the room. The idea, he says, is to acknowledge the inherent connections with one another in choosing to be in the same place at the same time, having this experience. “To see and be seen,” as he puts it. In his “real” job, Ricker, 56, is a crisis counselor for a nearby municipality. For the past 15 years he has provided crisis intervention, consultation and counseling to “people who are having the worst day of their lives,” he says. Some are individuals who’ve come back from war zones, or immigrants who feel a disconnect between their native cultures and their lives in America. Some are people who end up in bad relationships or have no job, who often have access to guns. Ricker is the one who goes out into the community, responding to resident, police or emergency-room calls, and talks people back from the ledge—at times literally. His goal is to get them out of their crisis and help figure out how they can help themselves. At the end of each day he asks himself, “Is everyone safe?” He wants to be able to say yes.